Hong Kong Airlines Announces Two More Long Haul Travel Destinations! Following the success of its Vancouver launch in June, Hong Kong Airlines announces plans to launch two more North American and one European travel destination: Los Angeles, San Francisco, and London. Are more cities on the carrier's radar screen? Hong Kong Airlines will launch non-stop service between Hong Kong and Los Angeles International Airport on 18 December 2017. Using Airbus A350 aircraft, the flight will operate four times a week until 15 January 2018. From then on, the flight will operate daily. The flight will be the airline's first travel destination in the United States. Hong Kong Airlines launched non-stop service linking the former British Crown Colony with Vancouver, British Columbia, on 30 June 2017. The new service coincided with the eve of Canada’s 150th anniversary and the 20th anniversary of Hong Kong’s handover to Chinese sovereignty. The flight between Hong Kong and Vancouver operatea daily in both directions. Vancouver is the airline’s first travel destination in North America. 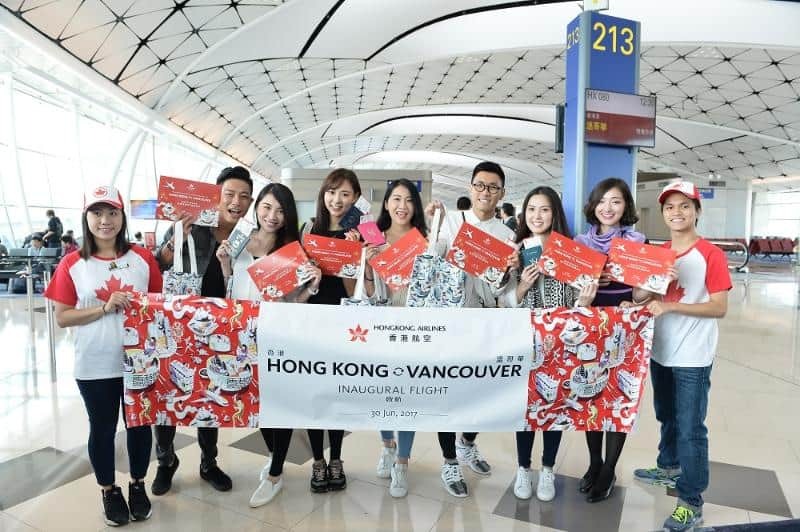 Passengers on the first flight Hong Kong Airlines flight from Hong Kong to Vancouver receive commemorative certificates and souvenir flight bags. Hong Kong Airlines' choice of Vancouver as its first North American travel destination is not surprising as ties between Hong Kong and the West Coast metropolis are strong. Many people from Hong Kong migrated to Canada in the run-up to the 1997 Handover, with many of them settling in Vancouver. Quite a few Hong Kong emigres, however, have since returned to Hong Kong for various reasons. Established in 2006, Hong Kong Airlines serves 30 travel destinations across the Asia Pacific. It currently flies to travel destinations in Australia, China, Indonesia, Japan, Korea, New Zealand, and Taiwan. The airline operates a fleet of 33 aircraft, including nine Airbus 330-300s, nine Airbus A33-200s, and 11 Airbus A320s. Most of the airline's' airliners have a two-class configuration, with both business class and economy class seating. Four A330-200F cargo carriers round out the airline’s fleet. Hong Kong Airlines is a full service airline. It is one of three airlines based in Hong Kong. Cathay Pacific Airways and Cathay Dragon also maintain hubs at Hong Kong International Airport. Cathay Pacific focuses on long-haul routes while Cathay Dragon concentrates on mainland China and other regional markets. There is, however, some overlap between the two airlines’ route systems.